If Clue was a hot beverage, it would be Bovril. Enjoyed by a certain generation; forgotten about by others. Based on the Hasbro board game, this ninety four-minute murder mystery, set in New England, 1954, centers around the popular family favorite, Cluedo. 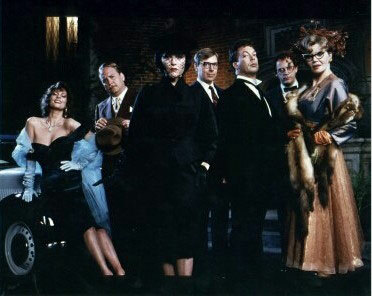 Tim Curry (The Rocky Horror Picture Show) plays stereotypical British butler, Wadsworth, tending to a selection of unacquainted guests at a dinner party. Each guest arrives under a pre-allocated pseudonym, corresponding to characters from the game. As the plot unfolds, a mysterious character with more hair grease than an acne-ridden teenager – Mr. Body – is introduced. True to the game, all the traditional weapons are presented as Body’s plan seemingly unfolds, entwining the characters in a web of blackmail and murder where everyone is a potential suspect. The picture unfortunately descends in to a ‘whogivesas**t” rather than a ‘whodunnit’ movie, with more substandard gags than a ‘Carry On’ box-set that overpower the well-written story. As the body count rose, so too did my eyebrows. Both sexist and homophobic remarks between characters cause the film to appear as out-of-date as Grandma’s flowery cardigan. This clever concept is let down by a scatty ending. With more turns than a Peruvian mountain road, it becomes extremely hard to follow late on. On the plus side however – set in the 50’s, some clever touches include a reference to contemporary U.S. domestic policy (Macarthyism/Cold War etc.) and multiple ending options on the DVD release. Performance of the film – With a young, energetic display that does not compare to the rest of his filmography, this is by phaal a substandard performance by Curry. Nonetheless, it beats the rest. Fact of the film – Cluedo was created in Birmingham, England by a solicitor’s clerk in 1949. The only discrepancy’s between the film and the game is that Mr. Green was actually a reverend in the UK version. Mrs White was also the cook. Score/Soundtrack – Some nice songs from the era, such as James Keyes’ Sh-Boom, and C. Calhoun’s Shake, Rattle and Roll. Nothing to write home about. Posted on 28/08/2012, in C, Comedy, Detective, Entertainment, Film, Movies, Reviews and tagged Cluedo, List of Cluedo characters, Rocky Horror Picture Show, Tim Curry. Bookmark the permalink. 1 Comment.